“At up to 450 pounds and eight feet in length, the Amazon dolphin, or boto, is the largest of the four known species of river dolphin. The others live in the Ganges in India and the Indus in Pakistan, in the Yangtze in China, and in the Río de la Plata between Argentina and Uruguay. All river dolphins are superficially similar, says Hamilton, yet the four species don't belong to the same family. DNA studies by Healy Hamilton of the California Academy of Sciences in San Francisco and others have shown that river dolphins evolved from archaic marine cetaceans (the order that also includes whales) on at least three separate occasions---first in India, later in China and in South America---before modern marine dolphins themselves had emerged as a distinct group. In an example of what's known as convergent evolution, geographically isolated and genetically distinct species developed similar characteristics because they were adjusting to similar environments. Mark Jenkins wrote in National Geographic: River dolphins “have fat, bulbous foreheads and skinny, elongated beaks suited to snatching fish from a tangle of branches or to rooting around in river mud for crustaceans. The jaw muscles can its elongated beak down on prey with crocodilain ferocity. Unlike marine dolphins, they have unfused neck vertebrae that allow them to bend at up to a 90-degree angle---ideal for slithering through trees. They also have broad flippers, a reduced dorsal fin (a larger one would just get in the way in tight spots), and small eyes---echolocation helps them pinpoint prey in muddy water. David Attenborough wrote: “The most primitive of tooth whales alive today are the dolphins that swim in some of the world’s great rivers, the Ganges and the Indus, the Yangtze and the Amazon...Their neck bones are still separate so they can move their heads from side to side and the bones in their fingers are still indistinguishable and separate withing the gristle of their flippers. All dolphins and whales have blowholes about the size of a quarter with inner valves and out outer valves to seal out water when the dolphin is under water. When they surface dolphins inhales four to ten liters of air in one second. They can blow bubbles from their blowholes. Bottlenose dolphins come to the surface an average of once every 28 seconds to breath. In aquariums they have been observed making rings and other shapes with bubbles and playing with them. Dolphins have several stomachs, like cows, which may be remnants from its terrestrial ancestors that lives tens of millions of years ago. Dolphins collect salt in their kidneys like camels. All toothed whales and dolphins produce sound to communicate, navigate, and locate prey and have a melon, an oval fat-filled organ in their foreheads. A melon focuses outgoing sounds. It evolved from a sac off the main nasal passage for moving air back and forth to create sound vibrations. The lower jaw helps catch returning vibrations. Dolphins whistle, grunt, squawk and make clicking noises. They make a variety of hissing noises like air escaping from a balloon by blowing air through nasal sacs inside their skull. Most sounds are made in the nasal passages not the larynx. Some believe the clicking noises are generated by forcing air from two sacks near the blowholes. Others believe they are formed by forcing nasal plugs against bony edges of the skull. Dolphins “hear” using their jaws. They don’t have an outer ear. Instead, sound travels to the inner ear through a thin "window" in the lower jawbone. Clicks can be rattled off at a rate of up to 700 per second or generated as a drawn-out individual sound. The frequency of these clicks varies between 20 cycles per second and 170,000 cycles per second. The human ear can only detect sounds as high as 16,000 cycles per second. Dolphin click frequency Dolphins---like bats and many whales---use echolocation to locate objects. They make whistles, and ultra-sounds with frequencies of 200,000 vibrations a second with their larynx and produce clicks by forcing air through special passages and sinuses in the heads. The clicks and ultra-sounds pass through the melon, where the clicks are focused, and strike objects outside the dolphin and return to the dolphin brain like radar, enabling a dolphin to determine the distance and certain things about the objects. Blindfolded dolphins can detect a object three inches in diameter from a distance of a 120 meters. Dolphins rely on echolocation more than sight to sense objects. Not only can they deduce the presence of an object with echolocation they can deduce its size and what it is. They can also determine if a container is full or empty and distinguish between a rock and a piece of flesh. Studies have shown that dolphins are almost as good at picking out objects of different shapes and sizes when they blindfolded as when they are not blindfolded. River dolphins are nearly blind. They have very small eyes. Indus and Ganges dolphins even lack lenses and can do little more than distinguish light and dark and night and day. The water they swim in is often so muddy that even if the could see they could only see a few inches in front of them. In the sea, dolphins use their echolocation primarily to locate and catch fish. River dolphins use it primarily to navigate through the murky water so they can sweep for fish. They swim on their sides and sweep their long bony snouts in wide arcs across the river bottom, emitting long trains of echolocation clicks that let them hunt fish in all but opaque waters." Dolphins are among the most vocal animals. They communicate by using body language and at least 30 different sounds and vocalizations. Members of a group can communicate with one another of large expanse of open ocean. They can hear each over of at least half a mile. There are still a lot basic things about dolphin communication that scientists don’t understand: for example how they synchronize themselves when the leap in formation. Dolphins use unique whistles to identify themselves and make sounds to express excitement and moods and exchange messages that help keep groups together and warn others of danger. Individual identity is practiced by humans and dolphins but few other members of the animal kingdom. Tony Martin of the University of Kent in England has studied Amazon dolphins since the mid 1990s rold National Geographic, "The males beat the hell out of each other. They are brutal. They can snap each other's jaws, tails, flippers, lacerate blowholes. The large males are literally covered with scar tissue." Only a small percentage of males turn bright pink, Martin says, and those are the ones females are most attracted to---at least during the mating season, when the water retreats back into the river channel and both sexes are thrown together. Being pink is not the only strategy males have for impressing females. They also sometimes pick up weeds or a piece of wood with their beaks, twirl in a circle, and smash the object on the water. Locals long believed the dolphins were just playing, but Martin discovered that only males carried objects, and only in the presence of females. What's more, they were 40 times more likely to get into fights when engaged in such ostentatious behavior. No other mammals besides humans and chimps carry objects for display, says Martin. "It's like a guy showing off---the equivalent of having a Ferrari," he explains. There are stories of how the river dolphins rescued and saved the lives of fishermen and villagers who are drowning or being attacked by crocodiles. According to a Cambodia legend they are descendants of beautiful woman who was forced by her parents to marry a grotesque python. Rather than go through with the marriage she leaped into the river to commit suicide and was transofmedd into a dolphin. Along the Mekong River there are taboos about catching and eating river dolphins. Even so dolphins suffer from the presence of humans. They get trapped in nets and can’t surface and drown. Fishermen don’t cut the nets because they don’t want the expense of repairing their nets. Conservationist are urging fishermen to switch back to traditionally bamboo nets which don’t endanger the dolphins. The Khmer Rouge reportedly killed hundred of dolphin in Tonle Sap to discourage superstitions surrounding them and extract oil for machines..
Irrawaddy dolphins are found in the Mekong River in Laos and Cambodia, the Mahakam River in Kalimantan in Indonesia, the Padma River in Bangladesh, the Irrawaddy River in Myanmar, and the Yangtze in China. They were once found on the Chao Praya River, which flows through Bangkok, but haven’t been seen there in decades. The Yangtze river dolphin is considered to be an Irrawaddy dolphin. The Indus dolphins and the Ganges dolphins live in the Indus River in Pakistan and the Ganges in Nepal, India, and Bangladesh. There are about 500 Indus dolphins left and it t is believed that the concrete barriers that divide the river may interfere with the mammal's ability to breed. Ganges dolphins are better off because their population is spread out over a larger area. There are a few dozen freshwater dolphin---the Irrawaddy dolphin—living in the Mekong River. Harmony Patricio told mongabay.com: The dolphin that has a lot of cultural significance.“People really honor the dolphin, and there are many stories about dolphins helping drowning people or helping fishermen to catch fish. So they never kill the dolphins. T he Mekong River Irrawaddy dolphin (Orcaella brevirostris) population inhabits a 190 kilometers stretch of the Mekong River between Cambodia and Laos. The latest population is estimated between 64 and 76 members (2008 figures). The Irrawaddy dolphin is identified by a bulging forehead, a short beak, and 12-19 teeth on each side of each jaw. The pectoral fin is broadly triangular. There is a small dorsal fin, on the posterior end of the back. In 2004, the Irrawaddy dolphin was declared a protected species. Most are found around the Khone Falls area in the Mekong River along the Laos-Cambodia border. Some believe they will be extinct in less than 50 years. Many have been killed by gill nets and dynamite fishing used mostly by Cambodians. Some fishermen have purposely caught them for their teeth, which are regarded as talismans against evil spirits Today villagers are encouraged to participate in the tourism trade in the area and so they have reason to conserve the dolphins. Khon Island near Siphandan (on the Mekong River north of the Cambodian border) is place where tourist gather to try and catch a glimpse of the river dolphins. They are most likely to be seen off the southern tip of the island in the early morning or late afternoon from December to May. The best spot of all is on Kham Island, a small sand island within Cambodian territory on the Mekong River. Boats make runs to this island for a small fee. Viewing the dolphins from boats isn’t really practical because the boats scare the dolphins off. The Irrawaddy dolphins found in Cambodia live mainly in the Mekong River around Kratie and Stung Treng provinces. The number of these mammals is estimated to be between 40 and 60 and they are often seen travelling in small groups of 6 to 10 individuals. The females usually give birth to young once every two years most often during the months of June to August. The young dolphins are about 1 meter in length at birth and suckle milk. By adulthood the dolphins can attain a length of over 2.5 meters and weigh up to 180 kilograms. Their diet consists mainly of small fish, shellfish and snails. The dolphins can swim at speeds up to 40 kilometers per hour and stay submerged for periods between five and ten minutes. The Dolphin Habitat in Kratie, Cambodia is situated at Kampee Village and Resort in the Sambok Commune. Besides being a wonderful tourist hub the Dolphin Habitat, also plays a significant role in the conservation of dolphins. The Irrawaddy Dolphins make their home on a beautiful stretch of the Mekong River near a small set of rapids. They make upward arches, breaking the surface of the water as they swim about the area. The dolphins are most active in the early morning hours (around 6 am) and the late afternoon and early evening hours. A local family hires out their small boat. A young man in the family takes you out on the river for a closer look. The charge is 3,500 riel per person. The Mekong River Irrawaddy dolphin (Orcaella brevirostris) population inhabits a 190 kilometers stretch of the Mekong River between Cambodia and Laos. The latest population is estimated between 64 and 76 members (2008 figures). The Irrawaddy dolphin is identified by a bulging forehead, a short beak, and 12-19 teeth on each side of each jaw. The pectoral fin is broadly triangular. There is a small dorsal fin, on the posterior end of the back. The organization said it was investigating how environmental contaminants got into the Mekong, which flows through Cambodia, Laos, Myanmar, Thailand, Vietnam and the southern Chinese province of Yunnan. The WWF said it suspected that high levels of mercury found in some dead dolphins came from gold mining activities. It added that Irrawaddy dolphins in Cambodia and Laos urgently needed a health program to counter the effects of pollution on their immune systems. Inbreeding among the small population could have also contributed to weakened immune systems of the young dead dolphins, all of whom were under two weeks old. “The Mekong River dolphins are isolated from other members of their species and they need our help,” WWF Cambodia country director Seng Teak said, adding that the mammals “can show remarkable resilience” if their habitat is protected. The Mekong River Irrawaddy dolphin, which inhabits a 190km stretch in Cambodia and Laos, has been listed as critically endangered since 2004, the WWF said. Thousands of Irrawaddy dolphins once swam in the Mekong. Although regarded as sacred in Cambodia and Laos, their numbers were cut by illegal fishing nets and Cambodia’s drawn-out civil conflict, in which dolphin blubber was used to lubricate machine parts and fuel lamps. The Mekong is one of only five freshwater habitats in the world for the Irrawaddy dolphin, and Cambodia was thought to support its largest remaining population. With their pale grey skin and blunt beaks, Irrawaddy dolphins resemble porpoises more than their sea-going cousins, and congregate in a handful of the Mekong’s natural deep-water pools. The Cambodian government has been promoting dolphin-watching to attract ecotourism and cracked down on the use of illegal nets that entangled them. It was hoped that banning fishing nets in dolphins’ protected areas would raise their number to 170 within the next few years. The fresh water dolphins of the Indus River in Pakistan and the Ganges in Nepal, India, and Bangladesh are strange creatures. First, they are nearly blind. Biologist Kenneth Norris said, "They have very long snouts lined with teeth that they seem willing to use in defense, unlike most dolphins. Ranging from five to eight feet in length, they swim on their sides and sweep their long bony snouts in wide arcs across the river bottom, emitting long trains of echolocation clicks that let them hunt fish in all but opaque waters." Ganges river dolphin reaches lengths of between 2 and 2.6 meters and weighs between 80 and 90 kg. They have a long beak. Its habitat is the Ganges, Brahmaptra, Meghna, Karnaphuli and Sangu Rivers and their tributaries. The estimated surviving number is 3,000 to 4,000. The dolphins in the Brahmaputra are known locally as su. They reportedly swim up the Brahmaputra almost all the way to Assam. Ganges river dolphins eyes distinguish only between light and dark. They navigate in murky waters using echolocation. The swim slowly but rarely stop. They use their sonar to detect fish and the then snag them with their long beak. Ganges river dolphins often swim on their sides, with their flippers undulating from side to side. The tips graze the bottom for orientation. Using this technique they can move easily in shallow water. Ganges river dolphins are threatened by pollution, gill nets, poaching, dramas and degradation of their habitat. It is believed that the concrete barrages that divide the river may interfere with the mammal's ability to breed. Ganges dolphins are better off than the Yangtze or Irrawaddy dolphins because their population is spread out over a larger area. 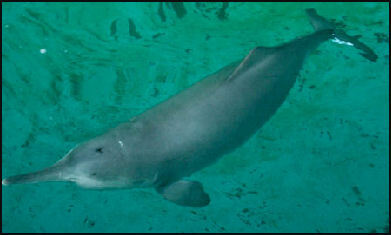 The baiji, a freshwater dolphin species, is the rarest and most endangered of all whale, porpoise of dolphin species. It lives on a 1,000-mile stretch of the Yangtze river between the mouth of the river and the Three Gorges. They have traditionally been viewed by some as "the Goddess of Chang Jiang" and are a good omen to any fisherman who spots one. The Yangtze river dolphin is considered to be an Irrawaddy dolphin. Baiji Baijis, also known as white flag dolphins or Yangtze river dolphins, weigh between 300 and 500 pounds and reach a length of 8.5 feet. They have a long snout and small eyes and have white sides and a pale blue grayish back. They feed primarily on fish, which they locate with sonar since they are nearly blind. Baijis can live to be 25 to 30 years of age. They stay under water for an average of 20 seconds and can dive for up to two minutes. They are usually found in pairs or social units of 10 or so members. Some scientists regard them as a subspecies of Irrawaddy fresh water dolphin. There are four generally recognized species of freshwater dolphin. The Irrawaddy fresh water dolphin is found in the Mekong River in Laos and Cambodia, the Mahakam River in Kalimantan in Indonesia, and the Yangtze in China. They were once found in the Chao Praya River, which flows through Bangkok, but haven't been seen there in decades (See Laos). The three other live in the Ganges in India, the Indus in Pakistan and the Amazon in South America. 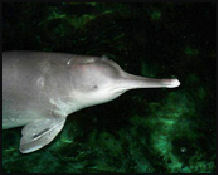 For millions of years river dolphins have inhabited the Yangtze. The first are believed to have migrated up the Yangtze 20 million years ago. “The Amazon species probably has the best prospects; though its numbers are uncertain, Martin thinks at least 100,000 are left. But the trend is worrisome. At the Mamirauá Reserve, Martin's study population has declined by half over the past seven years. Fishermen hunt dolphins for catfish bait, he says, and they also kill them accidentally in their gill nets. As of the 1990s only 100 or so baijis remained in the wild. Their number had declined from 6,000 in the 1950s to 400 in the 1980s to 150 in 1993 to 100 in 1995. At that point their future didn't look good: they live in one of the world's most densely populated areas and had a large part of their natural habitat gobbled up by the Three Gorges Dam project. Experts estimated that species would probably be extinct within 10 to 15 years. A survey of baiji in 1997 found 13 of them. A four boat survey in 1999 counted four. A pair was seen in Hongpu Lake in July 2005. A sighting was recorded in the summer of 2006. The last one captivity died in 2002. The baiji is now regarded as "functionally" extinct. A five-week survey in 2006 conducted by 30 scientists over 1,700 kilometers of the Yangtze, using sophisticated viewing equipment and ultra-sensitive microphones failed to locate a single one. August Pfluger, a Swiss researcher and leader of the survey told the Washington Post, "It is possible that there are two or three that we missed somehow but functionally they are extinct. It is finished. This is very, very, sad. "If they are extinct they are first species of whale dolphin, or porpoise to be made extinct by man. A Chinese man videotaped a baiji swimming in the Yangtze River in the summer of 2007. The man was quoted Reuters as saying, "I never saw such a bg thing in the water before so filmed it." He said he was about one kilometer away and it jumped several times. Baiji have mainly been done in the last two or three decades by sewage and pollution dumped into the Yangtze and noise created by ship propellers which disrupt their sonar-based sensory system, making it difficult for them to find food and navigate through the river's murky waters. They have also been trapped in nets, hurt by boats dragging the river bottom and injured by motor boats. The fish they feed have been overfished with large nets. Many baiji have been snagged on rolling hooks, illegal fishing devices consisting of braided lines with a hundred or more hooks hanging off them. An effort is being made to set up a sanctuary for the dolphins in a 13-mile-long oxbow lake, 150 miles upriver from Wuhan. For several months a year, the lake floods and is replenished with fish from the Yangtze River. So far this effort has been less than successful. The first dolphin placed in the sanctuary died after it got tangled in a net that separated the reserve from the river. After this construction began on a concrete barrier that didn't endanger the dolphins but allowed water and fish to flow in. The leader of the save-the-baiji movement is Wang Ding, the director of river dolphin research at China's Institute of Hydrobiology and leader of the Wuhan Baiji Conversation Foundation. To save the dolphins and make the public aware of their plight, statues of the animals have been erected and a local brewery even introduced Baijitun beer. There is also a species of river porpoise: the finless porpoise. In 1993 2,700 lived in the Yangtze. Less than 1,000 live there now according to an expedition in 2006. So they don't go the same way as the baiji and colony of 30 of them has been established in nature preserve, far from the polluted river. The hope is that they will reproduce. Text Sources: National Geographic, Natural History magazine, Smithsonian magazine, Wikipedia, New York Times, Washington Post, Los Angeles Times, Times of London, The Guardian, Top Secret Animal Attack Files website, The New Yorker, Time, Newsweek, Reuters, AP, AFP, The Economist, BBC, and various books and other publications.